Raphael and his wife Helen are working with refugees in Nigeria. They have bought land to teach men better farming practices and are now focusing on training women with microenterprise and business skills. 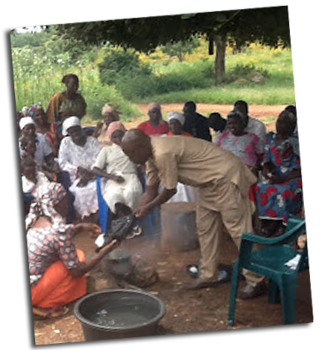 Project: To provide training for 50 of the most vulnerable, internally displaced women in northeastern Nigeria. Nearly two million people during the past nine years have been displaced from their ancestral homes in northeast Nigeria by the terrorist group known as boko haram. The majority of them are Christians who have become refugees. In 2016, Raphael’s development group BACCOT provided income generating training for 15 women. Recently, a spacious farm land has been acquired for the husbands of these women to learn better farming practices to provide food for their families and excess to sell. However, a large number of other women in the community are not so privileged like our beneficiaries. BACCOT will provide additional training for 50 women over the period of two years. The project will cover two areas: vegetable (such as pepper, tomatoes, cucumber, green leaf vegetable among others) and skill acquisition (soap making, petroleum jelly and beads making). The training will be conducted in three groups beginning in March 2018. This project will enhance capacity building for women who are at the forefront of community development in Africa. Beneficiaries will acquire valuable skills to enable them address basic family needs and address the issues of unemployment, poverty, bitterness, illiteracy and malnutrition. or download a pamphlet here.